Gutter protection for your home is often over looked by home owners. When you make your list of your needed home improvements, you probably don’t think about your gutters, or if you do, they are most likely very low on the list. We seldom think about our gutters, until something happens. However if you live in an area with a great deal of rain or other extreme weather conditions, installing a Gutter Guard may be one of the more important decisions you can make, in order to keep your home in good condition. Gutter Guards may benefit your thinking about. Why should you be thinking about Gutter Guards? Lets take a look. Do you really want to climb that ladder 2 or 3 times a year? Each year there are over 150,000 ladder accidents and of that approximately 300 deaths from those falls. Not to mention the multitude of broken bones and back injuries that are caused from these falls. So, is there an option available that can help you stay on the ground instead of trying to climb a ladder with a rake and hose in your hands? Yes! 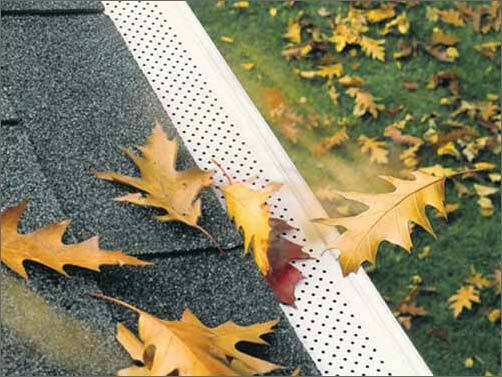 By installing a Leaf-Blocker Gutter Guard system you can keep your feet on the ground and your back safe from pain. Keep your homes foundation in top shape The foundation of your home may well be the most important part of your home. It looks indestructible, but it is not. Water damage can destroy your foundation and make it crack or crumble. Long term damage to your foundation can be prevented if you divert the water away from it by installing a Gutter Guard system. The hard work you put into keeping your yard in top shape will be protected You spend both money and time, to has take curly…have your home nicely landscaped. With gutters that are not properly maintained, the overflowing water can cause erosion or turn your hard work into a swamp. Keeping standing water from occurring can also help prevent disease. Standing water needs to be avoided for several reasons. Unwanted bacteria is able to multiply and grow uncontrolled in standing water. Mosquitoes breed in standing water and they can transmit West Nile Virus along with other diseases. You really do not want your gutters to look like an eight grade science experiment. Do you want to save money and make your existing gutters last longer? If you need to replace your gutters, it can become quite costly. By installing a Gutter Guard system, even on older gutters, you can save yourself from having to replace or repair them. When gutters become clogged with debris they become heavy and will fail sooner or later, causing damage to your home and of course an unneeded expense. Keeping your gutters working properly and clean, can increase their life span. No matter how old your gutters are, it is never to late to add the needed protection of a Gutter Guard system to your existing gutter.